If you’re looking for a local, professional moving service that can smooth out the wrinkles and bumps of moving a family or business, then consider Moving Connections. At Moving Connections, we are in the business of moving people, not objects. We understand that being uprooted and relocating to a new neighborhood or city can be traumatic. That’s why we strive to make your Orem move a seamless transition to your new home. Moving Connections is a local moving company that is affordable and yet professional. Moving Connections is federally licensed, bonded, and insured. Moving Connections hires only experienced moving crews. 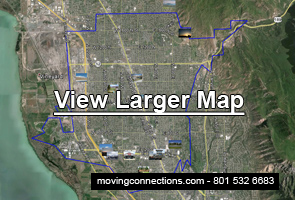 If Moving Connections is moving you to Orem it's a perfect time to begin to utilize the many resources and bounties of Orem. For example click on the picture to the left to go the Moving Connections 'Support - Advice - Assistance' page and discover Orem for the first time. Once you are on the 'Support - Advice - Assistance' page go ahead and open the .pdf link found there and tape the list of emergency and useful phone numbers on your refrigerator. Moving Connections has gone to great pains to find those links and connections to integrate you quickly into Orem life. Business owners like to get things done, and they don’t like “down time”. That’s why we at Moving Connections try to keep businesses up and running even while we’re moving them. Because every minute you’re down could mean a lost sale. We sympathize with businesses because we are a business and we know how critical it is to stay connected with potential clients. So we do our best to make your Orem corporate relocation a seamless transition to its new home. Moving Connections is a Moving Company offering a service called the “customer pack” move. This economy moving service allows you to provide the moving truck and driver, plus you pack most of the household goods, and Moving Connections provides the Orem loading crew. That is, you can save money by doing much of the labor intensive work yourselves. Moving Connections’ crew will wrap and load the heavy items onto the truck you have rented while you continue to pack the smaller, lighter, and less fragile items yourselves. Moving a family or just yourself can be a frenetic experience, bordering on traumatic. There are dozens of loose ends to connect, and thousands of details to look after. At such a time, the last thing you need is more fires to put out, more worries. Why not give yourself a rest and leave the details of moving to the professionals at Moving Connections? We’ve done this before, and we know how to make a move go smoothly. You can spend the time tending to other pressing matters while we provide you with the benefits of a Moving Connections full service move, including some peace of mind.